New York Governor Eliot Spitzer has resigned, after being linked to a prostitution ring. Flanked by his wife, he told a news conference he could not allow "private failings" to disrupt public work. He is to hand over power on Monday. Mr Spitzer again apologised for not living up to the standards he demanded of others - but he gave no details. Mr Spitzer had allegedly been identified arranging to meet a prostitute in a Washington hotel. Mr Spitzer made his name as an investigator of organised crime, financial crime and prostitution, and his fall from political grace is being seen as one of the biggest New York has known. At one point he was known as the "Sheriff of Wall Street" for the vigour with which he pursued dirty dealing in high finance. "Wall Street is enjoying he got his comeuppance," Michael Metz, chief investment strategist at Oppenheimer and Co told Reuters. And another trader told the AP news agency that some traders applauded as news of the resignation spread, with some firms opening bottles of champagne. In a brief resignation statement, Mr Spitzer said: "Over the course of my public life I have insisted, I believe correctly, that people regardless of their position or power take responsibility for their conduct. "I can and will ask no less of myself." He added: "I go forward with the belief, as others have said, that as human beings our greatest glory consists not in never falling but in rising every time we fall." And he said he would continue to try to serve society - but outside politics. He left the podium without taking questions from journalists. A White House spokesman said President George W Bush viewed the situation as sad. 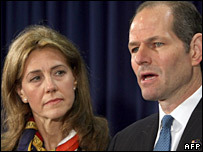 "He has Governor Spitzer and Governor Spitzer's family in his thoughts and prayers," said the spokesman. Mr Spitzer, 48, is married with three teenage girls. He is a leading supporter of Senator Hillary Clinton in her battle against Senator Barack Obama to become the party's candidate for president. When you make yourself out to be Mr Morality you fall harder than the rest. We all make mistakes. Mr Spitzer had been under pressure to resign since allegations that he used a high-priced prostitution service emerged on Monday. Federal authorities noted unusual movements from his bank accounts, which they linked to a front company associated with the ring. He is reported to have paid thousands of dollars over 18 months to the ring. A wiretap found a client, later allegedly identified as the governor, arranging to meet a $1,000-an-hour prostitute named Kristen. Reports say he paid more than $4,000 for her services. The BBC's Laura Trevelyan in New York says he could now be accused of breaking banking laws - but federal prosecutors say no deal has been done, quashing speculation that Mr Spitzer might have made an agreement to avoid charges before resigning. 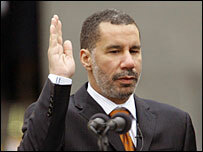 Mr Spitzer said he would hand over power on 17 March to his deputy, Lieutenant-Governor David Paterson, who will become New York's first black governor, as well as its first blind governor. Mr Paterson issued a statement saying it was time to get back to work.